Why would a young GP move to a rural region? You might rely on Anna Roberts in a medical emergency but possibly not a geographical one. The 30-year-old - who grew up in Edinburgh and studied medicine in Aberdeen - freely admits it is not her strong point. That was how she became a GP at the Charlotte Medical Centre. "I accidentally ended up in Dumfries about seven years ago," she said. "When you finish your medical training you do two foundation years - I did my first year in Glasgow, my second year in Dumfries. "I thought Dumfries was just south of Glasgow and then I watched the weather and saw a map and discovered that there is quite a lot south of Glasgow." Despite adding a few miles to her journey, however, she has no regrets and advises anyone thinking of heading south not to hesitate. "I was just pleasantly surprised by how nice an area it was," she said. "They should definitely come and try it." NHS Dumfries and Galloway is not alone as a rural region facing difficulties with GP numbers with a "significant number" of retirements in recent times. While many of them continue to help in a locum capacity, the total headcount has still fallen by more than 5% in the space of less than two years. The health board has a number of initiatives to try to tackle that, but Dr Roberts said there were definitely still issues to overcome. "A lot of people just don't really know very much about Dumfries and Galloway or the fact that it exists," she said. "I think it is very easy to get into that central belt mentality - and I was definitely guilty of that as well." However, after she made the move she said it was nice to develop mutual trust and respect with colleagues "rather than being an anonymous person in a big city". One obstacle to GP recruitment, Dr Roberts said, could be securing employment for a partner - particularly if they have a different profession. 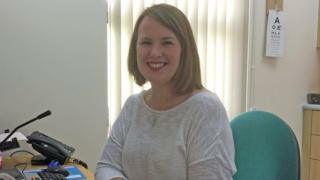 "If they are medical - and we have quite a few medical jobs going down here - then that's fine but there is not the same kind of young professional level in Dumfries as there is in a big city," she said. "You don't have all the big companies that you do there and that is not anything that we can fix. "That is definitely a challenge - part of it is just not knowing what is available outside the central belt." However, she said there were lots of other attractions. "It is a different lifestyle you can be outdoors really quickly here, there's loads of big mountain biking stuff here, there is quite a big arts scene and there are different festivals that are going on," she said. "There is a much more of a small-town feel to things. "They have got Guid Nychburris day - that was a whole new thing to me coming from Edinburgh, they don't have anything like that. "But I played as part of the town band for a while so I was part of that. "You can just really easily get involved with the community - I am really involved with my local church. "That's been really important for me to have friends that are not doctors as well. "I think if you are willing to branch out from just that medical bubble you can experience so much in Dumfries and Galloway." However, the Dumfries GP is under no illusion as to the scale of the problem facing the region and other rural areas. "It is really difficult because if a practice is struggling that does not make an attractive place for someone to go," she said. Her own practice lost three partners in a year and went through a "difficult time" before getting back up to full capacity. "If one person joins it makes it more attractive for another person to join - a lot of GPs will worry about being the last man standing," she said. "Where there are lots of retiring GPs that will make it a very difficult thing to recruit unless you get a few people that go in together and say: 'Actually, we are going to change this and we are going to be the young GPs there.'" She said getting trainees to come down to the area could be a secret to success - something NHS Dumfries and Galloway is trying to address. "When you are in a big city you often feel that you are a number on a rota whereas here you are valued," she said. "I think if we can get people as trainees here then they are more likely to stay. Dr Roberts said it was important for people to realise the role of the GP was changing too. She said it was now about "seeing the right person in the right place at the right time" which might not necessarily be a GP. "I think the important thing to say is that whatever practice people are at their GPs are doing their absolute best," she said. "We are often here late at night doing paperwork, finishing all that off - gone are the days of the GP going and playing golf at lunchtime. "I know there are a lot of struggling practices but I think it is important people do understand we are doing our best with what we have got here." NHS Dumfries and Galloway said it was "very conscious" of the national shortage of GPs but it was using "active and innovative" strategies to help with recruitment. "There are currently 12 local GP practices within Dumfries and Galloway which provide training to junior doctors," a statement said. "And we currently have 10 GPs in training within Dumfries and Galloway, who - once qualified - typically will go to spend an average 23 years attached to a local practice." So, perhaps, more will follow Anna Roberts on her journey to the region - even if they are not entirely sure where it is.